Jos Verlooy (BEL) and Japatero Vdm kick-started their Longines Global Champions Tour of Hamburg weekend with a speedy win in the first CSI5* class this morning. The young Belgian talent held off stiff competition from 59 of the top international riders in the world, finishing just tenths of a second ahead of Martin Fuchs (SUI) with Cristo and Karel Cox (BEL) with Evert. Amidst warm temperatures, the first day of competition at the LGCT Hamburg welcomed the world’s top horses and riders to the galloping grass arena of Derby-Park, and Frank Rothenberger (GER) set a fair and flowing 1.45m two phase test. This weekend will welcome tens of thousands of knowledgeable fans to the venue in Hamburg, Germany, with a special celebration - the 829th “Port Anniversary" adding to exciting atmosphere. Every year in May, more than one million people visit the shores of the Elbe to celebrate the anniversary of Hamburg's port. Highlights of the Port Anniversary traditionally include the arrival of 300 vessels including tall ships, traditional sailing yachts and cruise ships; the yearly Tugboat Ballet and a spectacular firework show. Along the harbour front, visitors can enjoy culinary delights and live music performances on numerous stages. And there was a bumper crowd for the first class of the day, with special support for their home riders. Clears came from Marc Houtzager (NED), Danielle Goldstein (ISR), Denis Lynch (IRL), Michael G Duffy (IRL), Olivier Philippaerts (BEL), Evelina Tovek (SWE) and Christian Ahlmann (GER) to name just a few, with the horses and riders looking on fine form for the weekend to come. But there were plenty of retirees, with many riders including Rolf-Goran Bengtsson (SWE), Nicola Philippaerts (BEL), Shane Sweetnam (IRL) and Laura Klaphake (GER) a few of those opting to save their horses energy for the classes yet to come. However Jos Verlooy (BEL) knew this would be an early class to win, and set off around the second phase with clear intent. 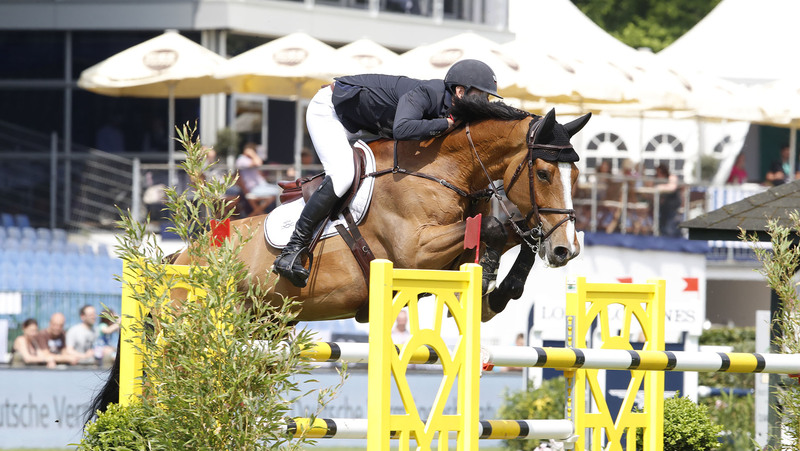 The rising star took his first CSI5* win on the 9 year old bay Japatero Vdm, with the big warmblood gelding clearly suited to the galloping grass arena. The next class of the day will be the GCL Hamburg first round, with the 19 teams fighting to gain pole position ahead of Saturday’s showdown. Tune in via GC TV to watch the action LIVE, with expert commentary, detailed and analysis and behind the scenes interviews with the riders.